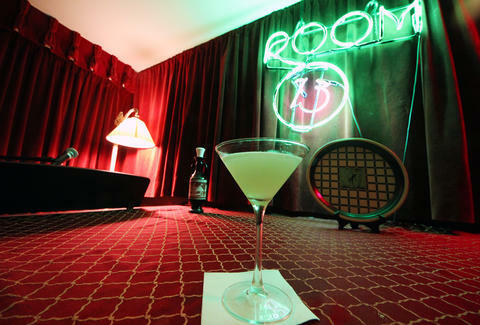 Meeting somewhere in the middle of the intoxicated choruses at Trader Todd’s karaoke bar and the muted B & B environs of the Old Chicago Inn is a members-only, 1920s-themed speakeasy that you've TOTALLY NEVER HEARD OF called Room 13. It's a password-protected space that’s open on Fridays and Saturdays and requires proper attire (suit jacket, no jeans, tommy gun). 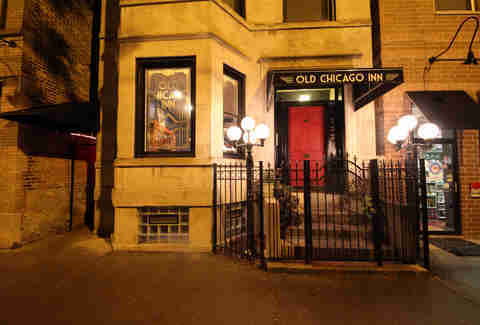 You’ll find the discreet alleyway entrance just to the left of the Old Chicago Inn on Sheffield and Belmont. 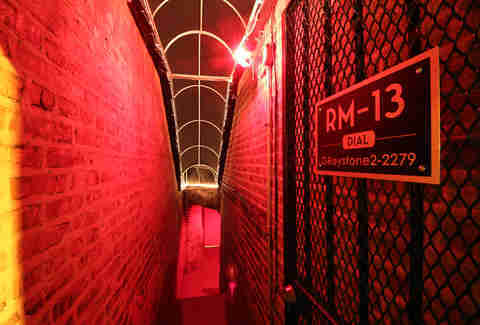 Find the red-lit gate with the "RM-13" logo -- it'll be open starting at 8p. Knock on the door, and you’ll be greeted by the doorman Luke asking you for the ever-changing password. 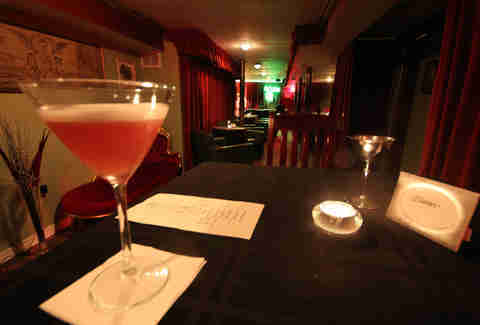 If you’re a hotel guest, you’ll receive an invite to the speakeasy. If you’re not staying the night, you can go the Stonemason route and apply for membership with a yearly fee. If you’re a wily cheapskate (!! 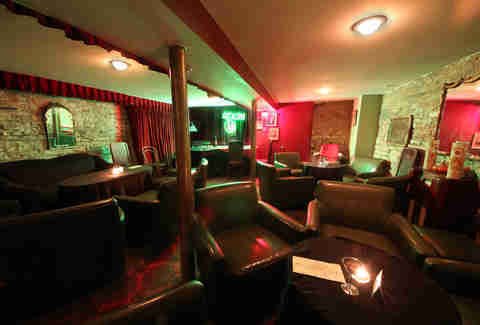 ), you can get in as a guest of a current member. Welcome to Room 13, so named for the hotel superstition of avoiding rooms with unlucky numbers. Here you’ll find awesome touches (uhhhhh), like photos of street cars passing by Wrigley (ohhhh), standup radios playing Pandora oldies on surround-sound, as well as an operable rotary phone with a phone book. If the bartender looks familiar, it’s because he just let you in (!). 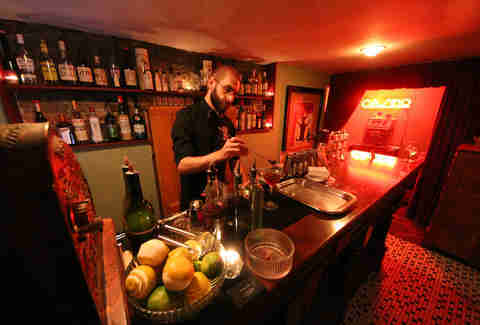 He’ll be making cocktails using only alcohol that was available in the prohibition era. That means a drink lineup of classic gin, whiskey, and Champagne cocktails in lieu of draft beers and vodka. 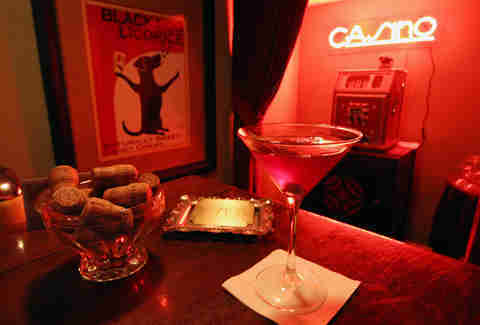 Sip on a Manhattan and try your luck on an old Blue Seal slot machine. Just be warned -- it’s just for show, so, like your middle school girlfriend, it’s not putting out. And not only are the booze brands from the 1920s, but even the egg whites in the Clover Club are measured out (about a half ounce) to the poultry portions that existed before our modern, genetically modified mega-chickens.